WILD KRATTS: BACK IN CREATURE TIME Movie is coming to “PBS KIDS Family Night, on the new WXXI Kids 24/7 channel. Pop some popcorn and join us for a weekly family viewing event feature movie specials or themed programming every Friday from 7 to 9 pm, and with repeats on Saturday and Sunday evenings. WILD KRATTS: BACK IN CREATURE TIME is a special of the popular series. In the special, Aviva unveils her most secret invention yet - the Time Trampoline! Now the Kratts crew can jump back in time and finally meet extinct creatures like the Dodo bird and the mysterious Tasmanian Tiger. Get ready with these activities! 2. Check out "Save Our Species Endangered Species Coloring Book" to learn about endangered animals in different regions of North America. Read online or print (PDF). 3. In WILD KRATTS: Back in Creature Time Chris and Martin encounter some extinct species and learn about their unique creature powers. You can dream up your own creature powers and draw your own creature power suit with this download. 4. It’s summer and it’s a movie night. What snack says summer and movie? BBQ Flavored Popcorn! Pop up some of your own using this recipe from PBS Parents’ Kitchen Explorers. 5. Be a creature explorer when you make your very own Park Explorer Kit. 6. Is your kid creature crazy? Feed your creature adventurer’s love of all things “animal” when you check out these nine books about animal sounds. The Wild Kratts crew lament the extinction of different animals in recent history and how they’ll never ever be able to see them. Aviva decides that it’s finally time to unveil her most secret invention yet – the Time Trampoline! Using the trampoline, the Wild Kratts jump back in time to meet the extinct Dodo Bird of Mauritius. But once there, they run into Gourmand’s ancestor, who decides Dodos are definitely on the menu! It’s Wild Kratts to the rescue! After their encounter with the Dodo Bird, the Wild Kratts decide to try out Aviva’s Time Trampoline again – this time to visit with the extinct Tasmanian Tiger. But their trip doesn’t go as smoothly as they hoped. 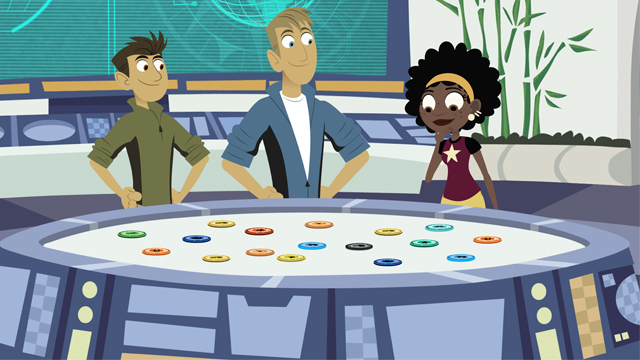 Not only do they run into the ancestors of Donita and Dabio – who are trying to get rid of all the Tasmanian tigers – but the Wild Kratts have to defeat Zach, who is hatching a plan to keep them trapped in the past forever! Airs Friday at 7pm and repeats Saturday and Sunday at 7pm. Get ready for Family Movie Night with WXXI Kids 24/7 on TV 21.4/Cable 1277/1278 or on WXXI Kids website or the PBS KIDS Video App.